Welcome to my build log. I have no clue what I'm doing, but with the help of the dreaded "search" bar, I've been able to navigate through some reviews and installs. Unfortunately, this won't be a ground up build as this truck was purchased mostly done up by PO. However, I find that there are little things here and there that can be improved. My goal is to build a truck that can take me to some of the most breath taking drives and scenery inaccessible by regular car around America. 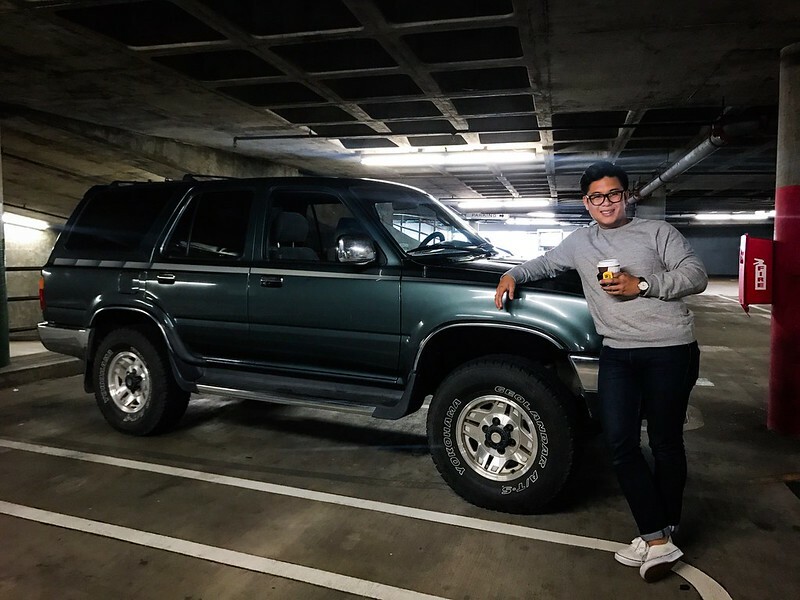 Before I had the FJ, I owned a 2nd gen 4Runner. Not too long after purchasing it, the truck started to have overheating issues, and had difficulty staying on. Good news was, I had a buyer who wanted to take it off my hands as is. Through this truck, I got a taste of off-roading and was hooked. After having a serious financial discussion, my GF gave me the green light to replace it with a more modern vehicle that would serve as our daily driver, grocery getter, family and adventure mobile. We casually found this on craigslist for a screaming good deal. It was previously owned by a CEO of a small tech engineering firm here in California. This truck was housed in Utah for when he would go on his fly fishing excursions, and he'd drive it to California when he needed to check into the office. He was in the middle of a International Scout restoration and wife made him let it go haha! 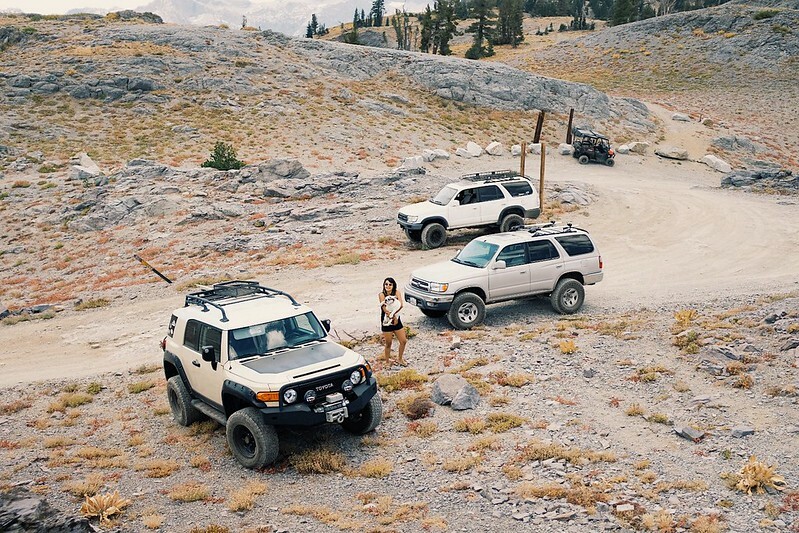 The week after getting the truck we headed to Tahoe to hit some trails and Hollister the following week. I didn't like the FJ at first, but it has grown on me...Actually the both of us. My GF and I often find ourselves getting into arguments on who's turn it is to drive it. IDFJ, Winterpeg, Hannibal and 9 others like this. Last edited by LorenzeTorres; 11-13-2018 at 12:10 AM. Great looking FJ! Have fun with your mods. I like the look of that. Can't tell you the lift height. I need to black out my trim pieces. The mods I have in mind are only for maintenance/ function. Fortunately and unfortunately, there's not too many more I want to add. Truck is super solid. Thank you very much! Me neither, I guess I can cross reference the part numbers on the spring and shocks. I shall update you as soon I decide to not be lazy. I didn't notice at first, thanks to the PO my truck is a bit more stealthy. If you post close-ups of your suspension we can probably help you figure out what you’ve got. Also I was wondering if you have skid plates - didn’t see them listed on your aftermarket equipment? If you are planning to go offroad much, armor is a great investment Also your side steps can cause dents in the body if they hit rocks so recommend you look at actual rock sliders. There’s a sweet set of sliders and skid plates for sale, local pickup in CA....thread just showed up here yesterday. Your rig looks great, and very glad you BOTH enjoy it! HAAAAA!!! !, That made me laugh, "My GF and I often find ourselves getting into arguments on who's turn it is to drive it." My wife and I fought over who got drive our 2010 FJ after we bought it and the argumant ended with us buying a second one. 2013 FJ Magma. I'll keep an eye on your thread to see how your argument turns out. "Mean Green" '10 Army green 4x4 AT ATRAC/rear locker. Demello 3 hoop w\BD sqd, Smittybilt M1 Gen2, PURE FJ sliders, EXPO-1 Wash Bottle, Ironman FCP-C's front, Boss 2.5 w/ TOYTEC 2.0 HD rear, SPC DOM LCA. 16" BF 285 KO2 E's on Method NV's. "Angry Orange" '13 Magma 4x4 AT ATRAC/rear locker, CRAWL. Demello 3 hoop Evil Eye w\BD sqd, Smittybilt M1 Gen2, AP sliders, EXPO-1 Wash Bottle, Ironman FCP-B front, Boss 2.5 w/ TOYTEC 2.0 HD rear. SPC DOM LCA's, 17" BF 285 KO2 E's on Method Holes. Lift height is probably 2.5 - 3". Any higher and you start to run into issues with ride comfort and IFS parts. 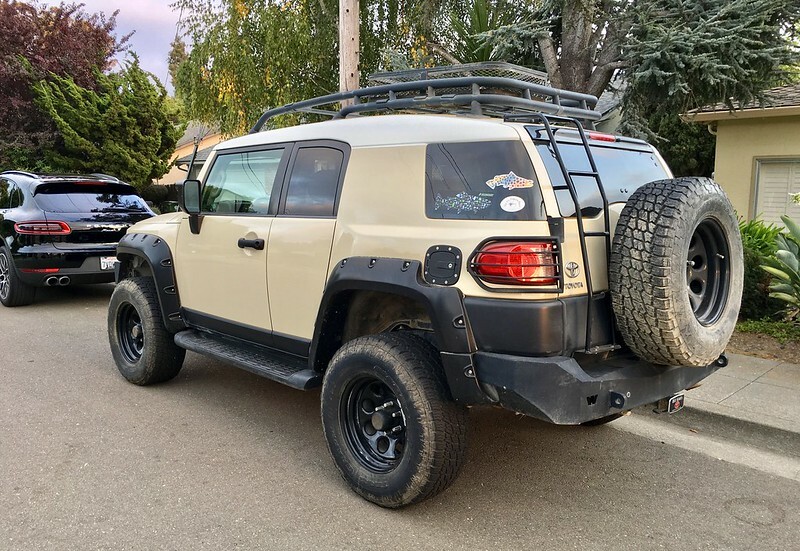 "Project Convince Spouse This Was a Good Purchase"
The best way to do this is to bring her to FJ Summit in Ouray, Colorado, on July 17-21 of 2019. This event sells out in seconds so you need to be sitting at your computer ready to register. Go ahead and create your account right now, and it would probably help if you booked your room already. Trust me on this, if you wait to book until you get into the event you may not get a room. 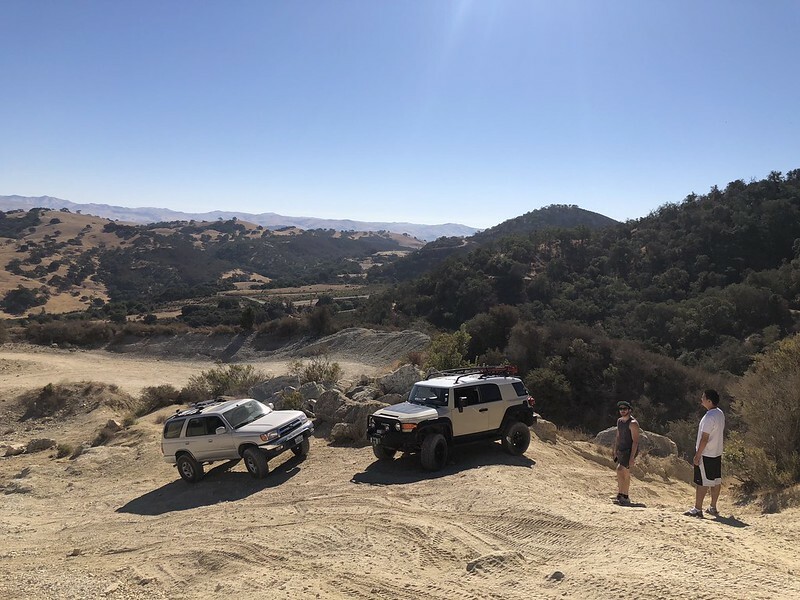 Next year will be my 9th year -- been leading groups at the event for 7 of those years -- and if there's ever anything you need to do in an FJ at least once, it's come to FJ Summit. ZerosFJ and GWebb like this. Nice score, that’s a nice looking FJC. Let me know if you need any tips on next steps.